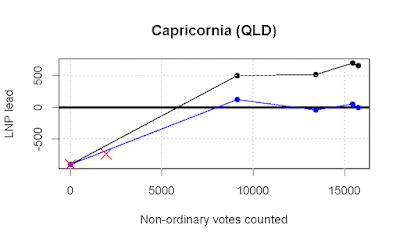 Now the postal votes have started coming in, I've been casting around for a way to visualise what's going on. 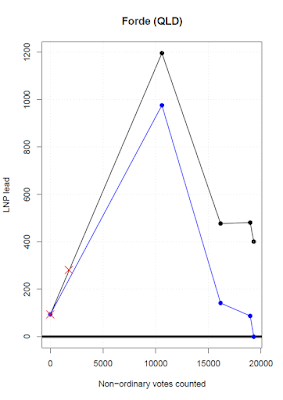 One way I've found useful is, as in my previous post, by using the predicted swings in non-ordinary votes (postals etc) compared to ordinary votes, using the 2013 results as a guide - these swings tend to go to the Coalition. 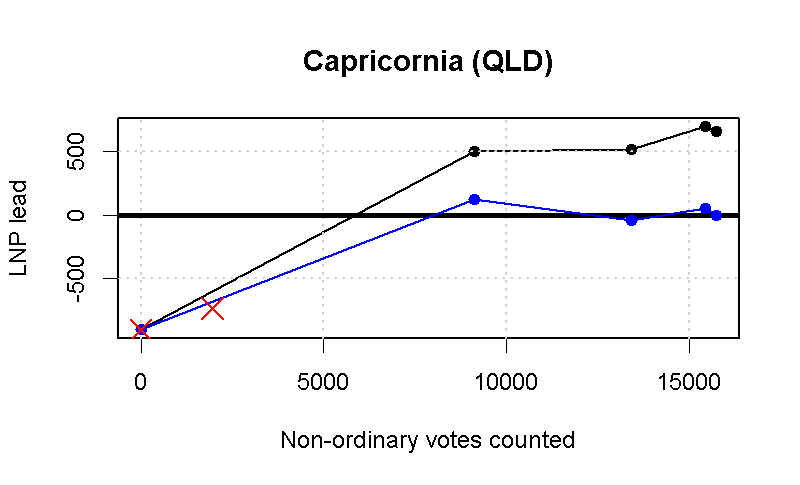 In the plots below, I've put those predictions in black, the relative overall swing needed on top of the postals swing for the Coalition to hit 50-50 in blue, and the data so far in red. 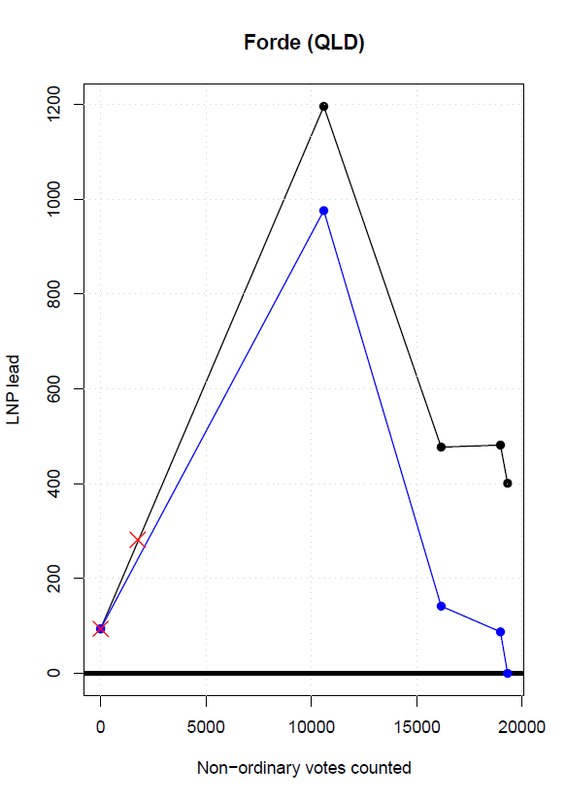 I've assumed the postals will come in first (they're all we have so far) and the other vote types afterwards (absent, pre-poll and provisional in that order - this probably isn't accurate!). In the seat of Forde, my earlier model currently predicts an LNP win by about 400 votes despite them only being ahead by 94 votes after ordinary votes. 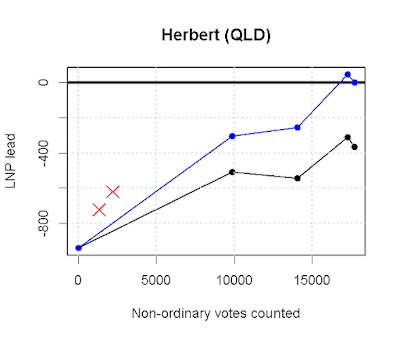 Though commentators were surprised by a "Coalition surge" as postal votes started coming in, it's actually quite consistent with 2013 results (see the red cross). 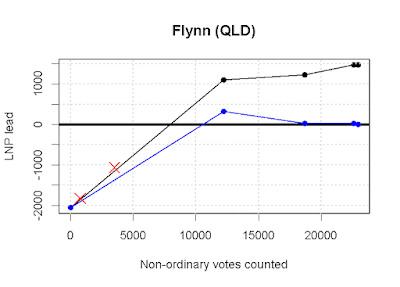 I've checked a bunch of other seats that my model predicted would be close (Batman, Chisholm, Cowan, Flynn, Gilmore, Herbert and Hindmarsh) and most of the other results have been relatively consistent with 2013 patterns as well (if not better for the Coalition), currently confirming my 76 seats prediction - except for one. 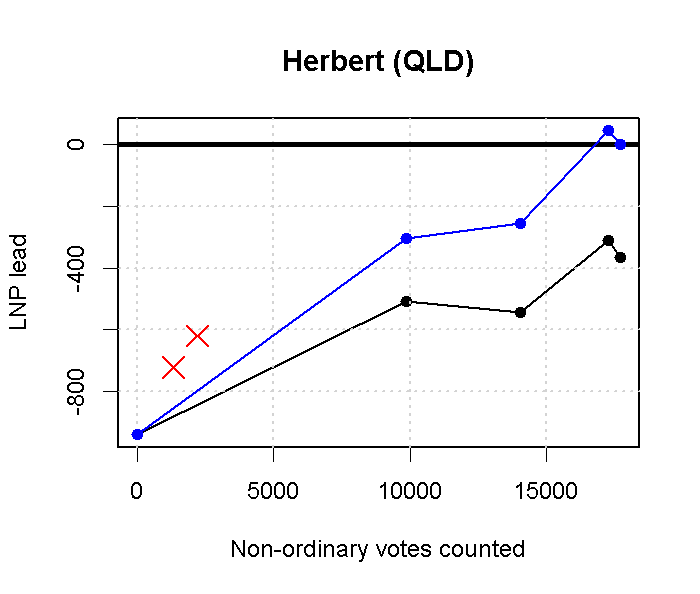 Herbert seems to be looking particularly good for the Coalition, well above where they need to be to make up the difference (see graph below - they're well above the predicted trend, and even well above the needed blue line).